After waking up to a cold house 3 mornings in a row and finding my programmable thermostat reset to its factory defaults I set out on a quest for a replacement. 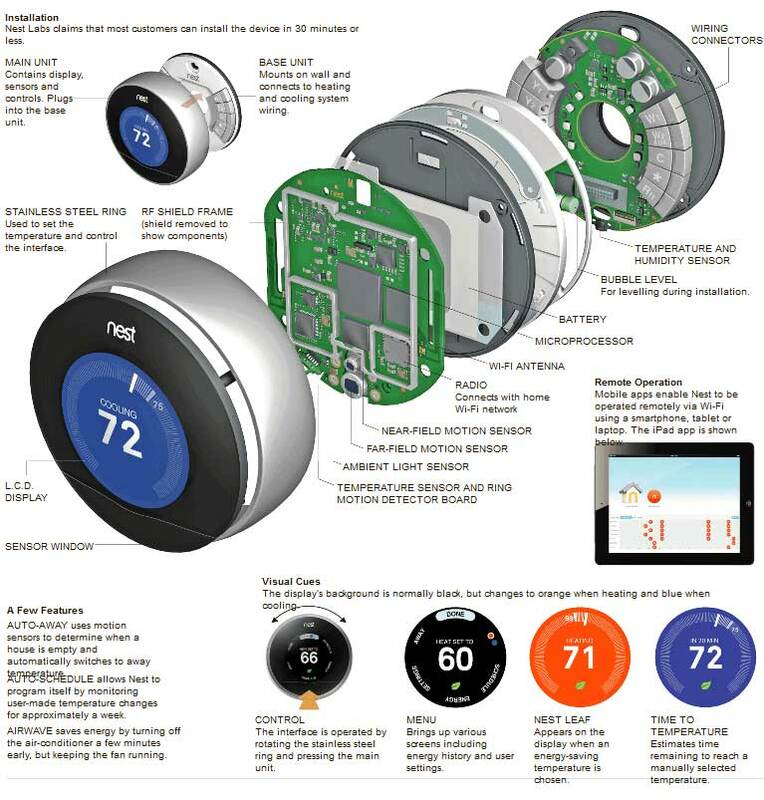 I’d seen the Nest Learning Thermostat before but always shied away because of the $250+ cost. After reading a review of the new 2nd generation unit, and customer comments saying the 1st Generation was better (and now cheaper), I decided to take another look at the Nest. By connecting to the Internet the Nest can be controlled remotely via computer or smartphone. It also receives software updates and monitors the weather outside your home. This last feature allows the unit to learn the thermodynamic properties of the structure and estimate the amount of time it will take to reach a requested temperature. Let’s say I program the thermostat to let the house be a little warmer when I’m at work. If it’s been programmed to have the house at 72-degrees at 5pm knowing the outside temperature and how log it’s going to take the AC to get to the requested temperature allows it to only run the AC as long as it needs to. So on a really hot day it might start the pre-cooling process at 3pm where a cooler day it might not start until 4:30pm. HVAC cycles are recorded and you can view the heating/cooling cycles for previous days. There’s even monthly energy reports available. Since I’ve only had the unit for 10 days it’s still learning. 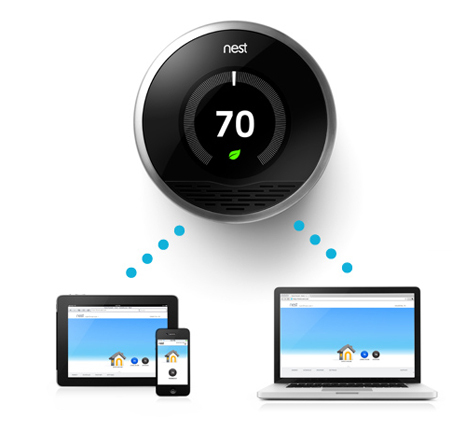 Future blog posts will further detail the long-term usage of the Nest. There’s a lot of chatter online about the Gen 1 vs. the Gen 2 versions of the Nest. The Gen 2 has a slightly different look to it and it’s designed to work with a greater variety of HAVC units. People who have “upgraded” to the new unit have a lot of complaints about how it does not seem to work as well as the Gen 1. The good thing is they both run the same software and have the same feature set. After verifying my HVAC system would work with the Gen 1 Nest I placed my order and saved about $75 in the process. One feature that Immediately got my attention was the heat/cool mode. You pick the upper temperature you’re comfortable with as well as the lower temp. 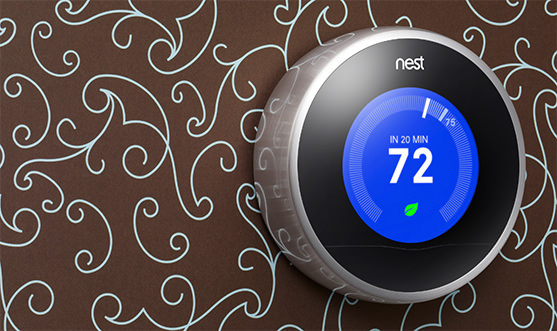 The Nest will heat or cool as necessary to stay within that range (no more manually changing modes). I have mine set for 66-74 degrees and that 8-degree range is enough to prevent my furnace or AC from running most of the day when the temps are in the 60’s-80’s. The Auto-Fam mode allows me to cycle the fan at just about any schedule I want. Currently I run the fan for 15-minutes an hour to keep the inside air from becoming stale. I used to leave the fan running constantly to help even the temperature between floors. A proximity sensor on the unit detects movement and after a few weeks it’s supposed to learn when you’re home or not. This allows you to set a broader temperature range. If your work/weekend schedule is pretty consistent this may be a good option for you. My schedule is not and I’m not sure how well this is going to work long-term. 10 days in and it’s still trying to “learn” my schedule. The display of the unit turns on when you approach it which is pretty cool. Call me lazy but being able to adjust the Heat/AC from anywhere is pretty cool. Especially when you wake up one morning to a house a little cooler than you want. Pickup the smart phone, tap tap tap, the heat comes on and you’re toasty in minutes. There’s a lot more to talk about but for now I’m going to leave you with this promo video that gives a good synopses of the Nest. Feel free to leave any questions in the comments section and I’ll do my best to answer them.